John is a Sheriff Officer in Gloucester County and is assigned to the transportation unit and County CBRNE Team as a Haz-Mat Technician. He also served in the United States Coast Guard and is a Desert Storm Veteran. John is also a Judge with the NJ State Fire Chiefs Parade Judges Association. Held the following positions for the Grenloch Fire Company, Treasurer, President, Safety Officer, Lieutenant, Captain and Company Chief. 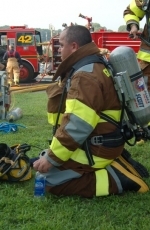 Fire Commissioner for the Washington Twp Fire District. Vice President and President of the Washington Twp Fireman’s Assoc.